The incorruptible shields and forges your inner and outer shell. It shapes you according to his will and absolute decree under his suffocating blackness. Polonium is highly dangerous and has no biological role. By mass, polonium-210 is around 250,000 times more toxic than hydrogen cyanide (the LD50 for 210Po is less than 1 micro-grams for an average adult compared with about 250 milligrams for hydrogen cyanide. The main hazard is its intense radioactivity (as an alpha emitter), which makes it very difficult to handle safely. Even in micro-gram amounts, handling 210Po is extremely dangerous, requiring specialized equipment (a negative pressure alpha glove box equipped with high performance filters), adequate monitoring, and strict handling procedures to avoid any contamination. Alpha particles emitted by polonium will damage organic tissue easily if polonium is ingested, inhaled, or absorbed, although they do not penetrate the epidermis and hence are not hazardous as long as the alpha particles remain outside the body. It has been reported that some microbes methylated polonium by the action of methylcobalamin. This is similar to the way in which mercury, selenium and tellurium are methylated in living things to create organometallic compounds. Studies investigating the metabolism of polonium-210 in rats have shown that only 0.002 to 0.009% of polonium-210 ingested is excreted as volatile polonium-210.Polonium has been found in tobacco smoke from tobacco leaves grown with phosphate fertilizers. Because it is present in such small concentrations, isolation of polonium from natural sources is a very tedious process. From the Greek word for a smell, osme. A soft, silvery-white metal that tarnishes easily. The use of thallium is limited as it is a toxic element. Thallium sulfate was employed as a rodent killer – it is odourless and tasteless – but household use of this poison has been prohibited in most developed countries. Most thallium is used by the electronics industry in photoelectric cells. Thallium oxide is used to produce special glass with a high index of refraction, and also low melting glass that becomes fluid at about 125K..
Thallium has no known biological role. It is very toxic and they’re is evidence that the vapour is both teratogenic (disturbs the development of an embryo or foetus) and carcinogenic. It can displace potassium around the body affecting the central nervous system. Thallium is found in several ores. One of these is pyrites, which is used to produce sulfuric acid. Some thallium is obtained from pyrites, but it is mainly obtained as a by-product of copper, zinc and lead refining. Thallium is also present in manganese nodules found on the ocean floor. The lorandite (THALLIUM CRYSTAL) from the mine can register in a chemical and physical way the so called neutron flux coming from the Sun. It is the only known substance that has this power. If the neutron could be explored, science could understand the processes that go on inside the Sun. Some say with awe that it could lead understanding the past but also the future of our galaxy. How did it ever get they’re, and only they’re? On a mountain (Kozuf) in the southern Balkans. One assumption, again resembling a movie scenario, is that – it fell from the Sun, as a result of eruption a billion years ago. origin of the element’s name (from Greek ‘thallos’, meaning ‘a green shoot or twig’), its toxicity and it’s use in the manufacture of reflective glass. Beryllium telescope mirror: View of the back of one of the 18 beryllium mirror segments for the James Webb Space Telescope. The ribs at the back of the mirror help to maintain the mirror’s strength and ability to hold its shape under extreme conditions. The front of the mirror is completely smooth and coated in a thin-film of gold. Photograph courtesy of the National Aeronautics and Space Administration. Photo courtesy of NASA. Beryllium is one of the lightest and stiffest metals, but there was little industrial demand for it until the 1930s and 1940s when the aerospace, defense, and nuclear sectors began using beryllium and its compounds. Beryllium is now classified by the U.S. Department of Defense as a strategic and critical material because it is used in products that are vital to national security. The oxide form of beryllium was identified in 1797, and scientists first isolated metallic beryllium in 1828. Beryllium and some beryllium compounds are toxic and must be handled carefully. Workplace related exposures to dusts or fumes of beryllium and beryllium compounds are known to cause serious health problems, such as cancer or chronic beryllium disease, which is an immune system response that can damage the lungs. Proper workplace practices prevent these exposures. Beryllium-copper alloys account for approximately 80 percent of the beryllium used in the United States. These alloys are strong, hard, and nonmagnetic; they are good conductors of electricity and heat, and they resist corrosion and fatigue. Beryllium alloys are used in making connectors, springs, switches, and other components of electronic and electrical devices for aerospace, automobile, computer, defense, medical, telecommunications, and other products. 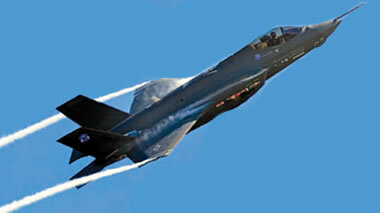 Beryllium in aerospace: The U.S. Air Force F-35 Lightning II Joint Strike Fighter and many other aerospace vehicles rely on electrical and mechanical components made of beryllium alloys. Photo courtesy of the U.S. Air Force. Did You Know? Beryllium pipes house the beams of subatomic particles in the Large Hadron Collider particle accelerator near Geneva, Switzerland. Beryllium metal is very light and very stiff-on a weight-to-weight basis, beryllium is six times stiffer than steel, and it maintains its shape at high and low temperatures. Beryllium metal is used in the aerospace and defense industries to make lightweight precision instruments. The mirrors of the Spitzer Space Telescope and the James Webb Space Telescope (JWST), which is scheduled for launch in 2018, are made of beryllium. 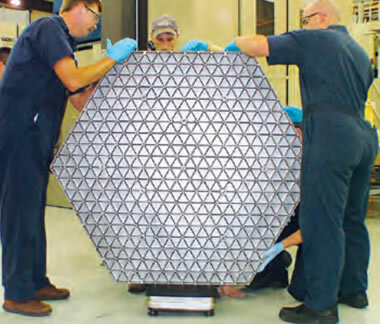 The primary mirror of the JWST contains 18 hexagonal segments (each segment is 4.3 feet in diameter) that must maintain their exact shape even at temperatures of -400 degrees Fahrenheit and must be light enough to be carried into orbit; the telescope will operate approximately 1 million miles above Earth. Beryllium is almost transparent to x-rays, and beryllium foil is used as window material in x-ray and other radiation machines. In nuclear reactors, beryllium metal and beryllium oxide are used to control fission reactions. Beryllium has also been used in the trigger mechanisms for nuclear weapons. Beryl gems: Four varieties of gemstone-quality beryl: from back left, going clockwise: morganite (pinkish-orange),heliodor (yellow), green beryl (pale green), aquamarine (blue-green). Where Does Beryllium Come From? Two minerals, bertrandite and beryl, are mined for beryllium, and both are found in association with igneous rocks. All the beryllium currently being mined in the United States comes from the mineral bertrandite. A complex series of events must take place to concentrate beryllium into bertrandite. First, a magma that is rich in fluorine, beryllium, and silica must erupt in an area where there are carbonate rocks (limestone or dolomite). If heat from the magma warms the groundwater in the area and causes the water to move through the surrounding rocks, the water picks up elements, including beryllium, from those rocks; the water may then react with suitable igneous or sedimentary rocks to crystallize minerals, including bertrandite. The mineral beryl is the main source of beryllium mined outside the United States. Beryl is most often found in veins or pegmatites, which are rocks that contain the last minerals to crystallize from a large igneous intrusion. Pegmatites are distinguished by large interlocking crystals that often include unusual elements and minerals.